Add some placement pizzazz to your tabletops with our custom table tent maker. Discover tons of professionally designed templates – just insert your own images, colors, shapes and text. Menus can get cluttered. And burying important information in a menu isn’t very effective. Drink coasters can help attract attention, but their space is limited. 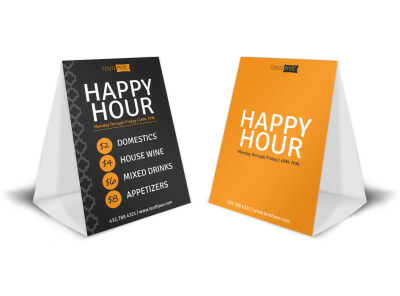 DIY Table tents, however, give your business the needed real estate to inform customers of specials, happy hours, events, sponsorships and more. And when you create a table tent with our proven and professional table tent maker, you know you’re getting a quality design to exceed your needs – regardless of your creative skills...or lack thereof. When to Use a Table Tent? Table tents bring attention to a captive audience. It’s the first thing customers will go to when they sit down. They also get your patrons talking about what they want to drink or eat before their server arrives to wait on them. 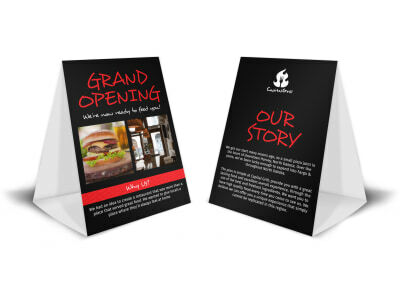 They’re essentially a welcome, and you want to make sure your table tents make a good first impression. But that’s not to say that table tents are strictly reserved for the restaurant industry. 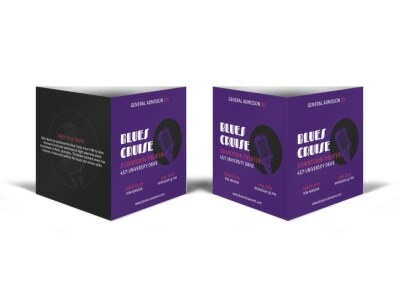 If you’ve got something you want customers to know, put a table tent somewhere you know they’ll see it – like on an end cap display, customer service desk, or on top of a nightstand in a hotel room. To break it down for you even further, here are 5 popular ideas (just to name a few) of when/where to use a table tent. Retail stores are full of signage. Sometimes large posters, other times small product tags. A table tent can wrangle customers in when they’re hands on with the product. Greet walk-ins with a smile and a stylish table tent regarding promos, sales and other important information. 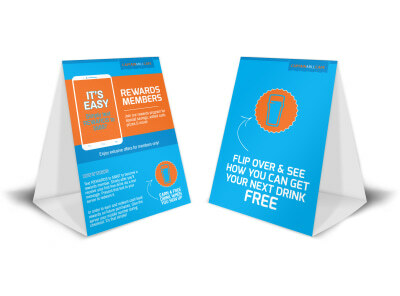 If you’ve got an upcoming event that you want customers to know about, table tents can help alert and present a call to action. Don’t be afraid of text. Images will draw them in, but text can get them coming back. They’re already sitting down with nothing to do but wait. It’s the perfect time to tell them something they don’t know. Why waste an opportunity to market to potential customers with a boring old “reserved” sign. Use a table tent and give those looking for a table some information, even if it’s just a link to your website online reservations. Why Make a Table Tent with Us? We want your tables to help you sell – you! With our variety of designs, dimensions and ready-to-print options, we’ve got the perfect table tent for a number of industries. Don’t miss out on your opportunity to convert business into more business with our custom table tent makers. Take it from the experts. When it comes to your brand. Your business. Your message. There’s only one shop that’s top, MyCreativeShop.